Banyan Tree is the National Tree of India, which is long and deep roots and branches, which symbolize the country’s unity. Banyan tree act as a shield, protects from hot sun, this the reason banyan tree is planted near temple, houses, roadsides and villages. Banyan Tree acts as a focal point of the Panchayats in the rural area and gathering place for the village councils and meetings. Banyan tree is used for high medical value , to treat and cure many diseases. Importance of Banyan Tree: Atharva Veda and and Rig veda stipulate that trees should be worshipped , for their inevitable role in human life. Banyan Tree is one of the sacred Tree, Lord shiva was sometimes depicted sitting in silence , under the Banyan Tree , the banyan tree symbolizes eternal life . Tree , in hindu culture is often called Kalpavriksha ,a Sanskrit word which means ‘a divine tree which fulfills the wishes’ . Hindu Married Woman worship Banyan tree for a long and happy married life. Features Of Banyan Tree: 1. It is characterized by roots, tangle of branches and trunks. 2. Banyan tree is deeply rooted that spread across several acres. 3. It is huge in size and protect from hot sun. 4. Tree bears fruits, the fruits which is red in color are not eatble. 5. Tree has a large and leathery dark green leaves , this leaves are used for animal fodder. 6. An Old Banyan tree can reach more than 656 feet in diameter, which can be tall as 98 feet. 7. The sticky milk of banyan tree produces rubber, which is used for gardening. Details of Banyan Tree: 1. 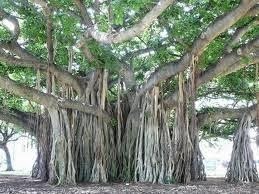 Banyan is Derived from Banias, who discuss their strategies regarding business , under tree. 2. Banyan Tree is located in Kolkata , tree is about 250 years old. 3. The bark and woods of banyan tree are used for making Paper. 4. Diabetic patients are treated by the tonic made from Banyan Tree. 5. Seeds and bark of Banyan Tree are used to produce herbal tonic , that can cool the body.